With my first singleton, I had a vaginal delivery. 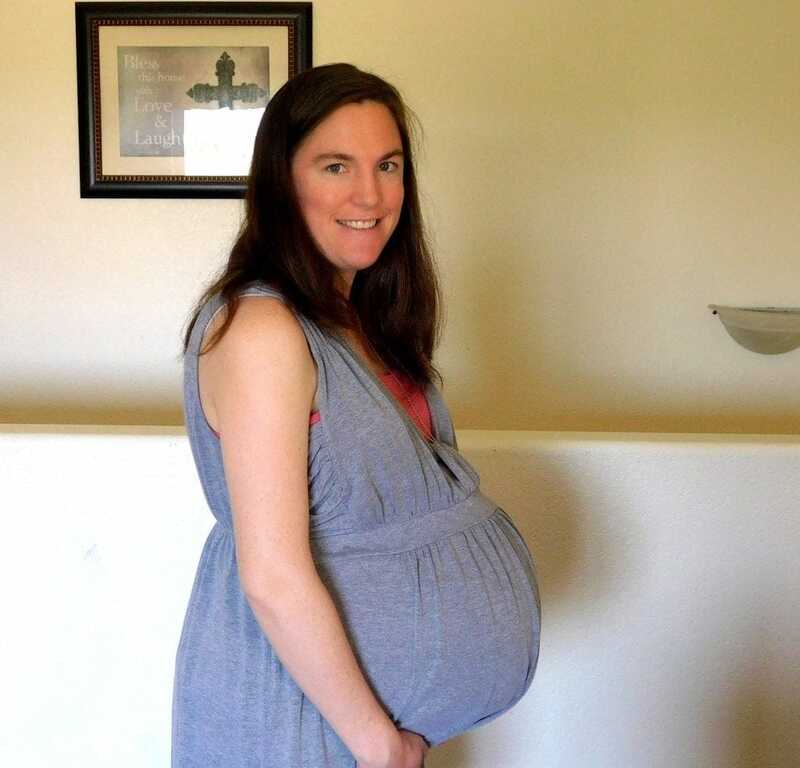 With my second child, I was intending to have another vaginal delivery—until around 35 weeks when I found out he was breech and I had to have a c-section, which was not the most positive experience. 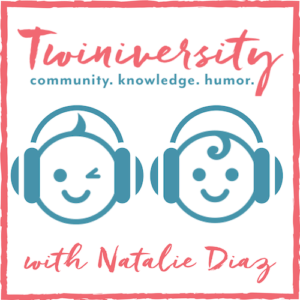 When I was around 28 weeks with my twins, I found out that baby A was breech and baby B transverse, so another c-section it was. This time, however, I was determined to have a better experience than I had with my first surgery. The day of my twins’ birth dawned bright and early on May 31, 2017. I didn’t sleep very well the night before, and so waking up at 4:30am wasn’t too hard. My father-in-law arrived to watch the older kids, who were still asleep, while my husband and I went to the hospital. I had been at the hospital three times before the birth, once for a non-stress test, and twice for other concerns that turned out to be nothing. I was so excited to finally be there to have my babies. 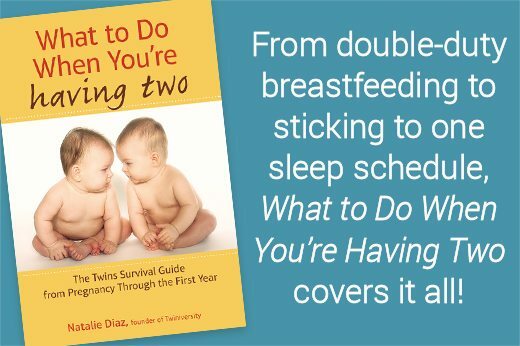 I was so done being pregnant with twins and not being able to breathe, eat, or sleep. The nurses led us back into triage where I put on my hospital gown, and they started my IV and hooked the babies up to the monitors. The atmosphere was very laid back, and the nurses chatted with each other and with me as they got me all prepped. There ended up being a little confusion about which OB/GYN was going to be doing the surgery. The nurses thought it was one doctor, but I knew it was another because the first was out of town. “No wonder she isn’t answering our calls,” the nurses said. It turned out that the doctor who was supposed to do the surgery had no idea he was supposed to, but luckily he was available and had no problems coming down. He was very nice and funny and spent the surgery cracking jokes, just as I expected. I could tell he really loved his job, and he especially loved delivering twins. 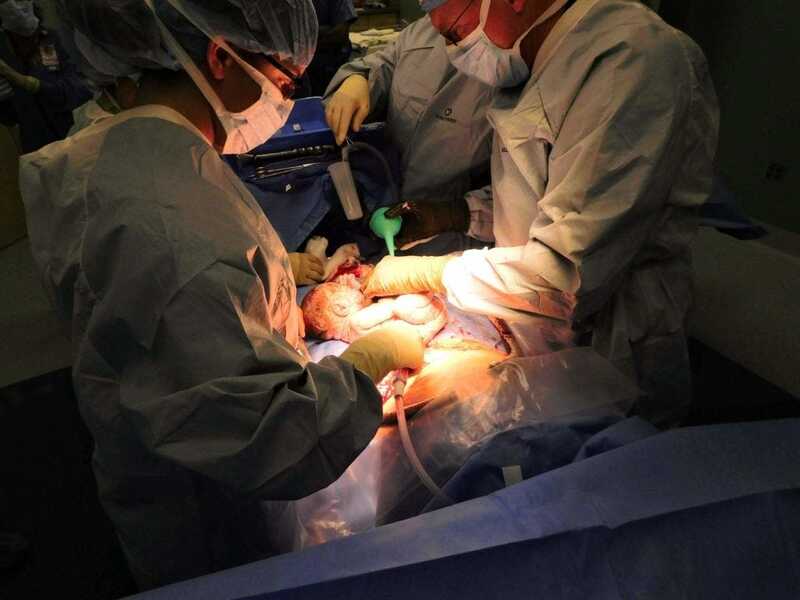 Before surgery, I told him my requests to make this c-section better than my last, which included lowering the curtain a bit while the babies were being delivered and holding them right away as long as they didn’t need to go to the NICU. 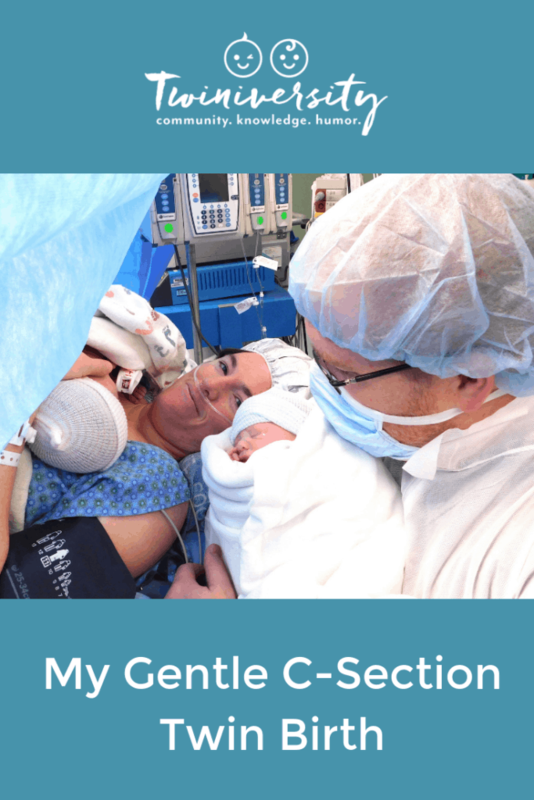 Without knowing it, I was describing a family-centered c-section, or gentle c-section. I also met with the anesthesiologist before the surgery and told her about the problems I had experienced with nausea and lightheadedness from the spinal last time, and she made sure I felt great during the entire surgery this time. She also eased my fears when I worried that the spinal hadn’t made me numb enough because I could still feel some sensation (but not pain). After the doctor arrived, we were finally ready for baby time. 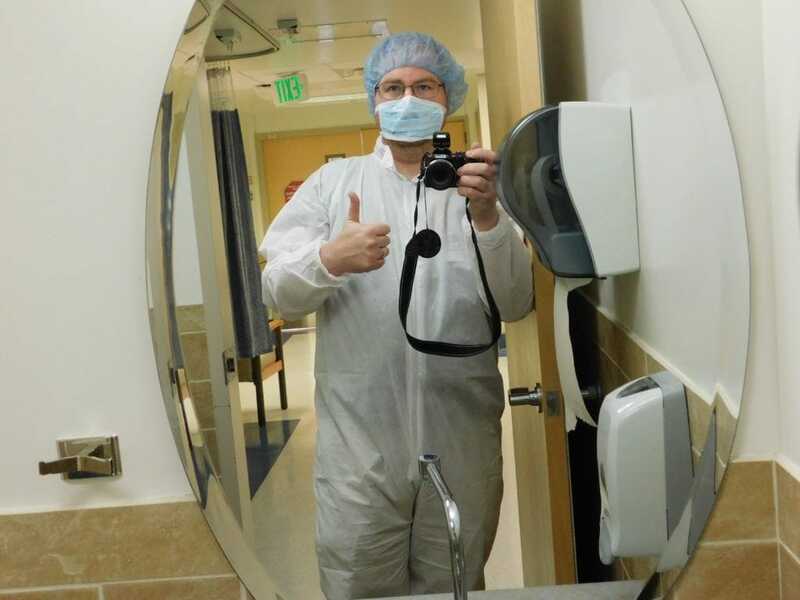 I made my way into the OR while my husband got himself ready. When I walked in and saw the two warming tables, I felt a surge of emotion. After all this time I was really going to have two babies. The day was here at last. After I had received the spinal and was numb and lying on the table, my husband joined me at my head (and I didn’t throw up on him this time, thankfully). “Almost there,” the doctor replied. At last, “Look, here he comes!” They lowered the curtain and I saw my baby boy. My husband began taking pictures. My son weighed in at 5lb 10oz and was healthy and doing well. Then the doctor went to deliver my daughter. She was transverse up high in my belly, and he had to reach way up inside me to pull her out. Let me tell you, I am so glad I couldn’t feel any pain, because that was the weirdest sensation I have ever felt. I just knew that he had his whole arm up inside me. Then she came out, and it was honestly like having the biggest poop in the world. It was instant and immense relief of all the breathlessness I had experienced for the last months of the pregnancy. All the discomforts of the pregnancy instantly evaporated. Again, they lowered the curtain and held my little girl (my first girl) up for me to see. She had a full head of dark hair just like her older two brothers. One of the nurses brought her around the curtain so I could see her, and I reached out and touched her hand. I really love the feeling of touching your baby for the first time, even before they clean all the goop off them. Her hand was very warm and so small and beautiful. Laying eyes on my first daughter for the first time was one of the best experiences of my life. After she was weighed in at 6lb 10 oz and cleaned up a bit, I got to have skin to skin with both of my babies. While my daughter was lying on me, she was so quiet I was worried something was wrong with her because she wasn’t crying. “She’s just happy to be close to her mommy,” one of the nurses said (and let me tell you, 15 months later, she still loves being close to her mommy.) After that, I got to hold my son too. We got a bunch more pictures and the four of us got to start our bond as a family, all while I was still being stitched up. Later, my husband told me that during this time they were counting cloths and every tool to make sure they didn’t leave anything inside me. I wasn’t aware of any of this because I was relishing holding my new bundles. 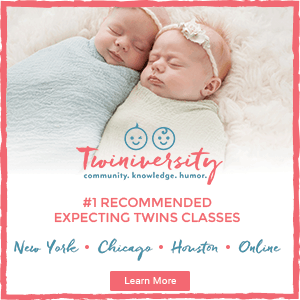 As difficult as my first c-section was, I feel like it prepped me to know what to expect and what to ask for to make my twins’ birth a great experience. 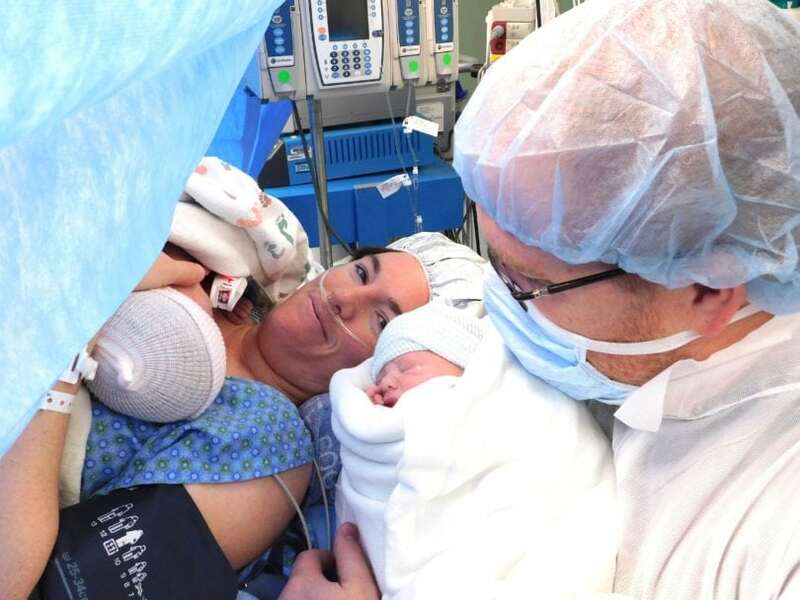 I am actually happy that it turned out to be a scheduled c-section because there were no complications and no NICU time for either of the twins. 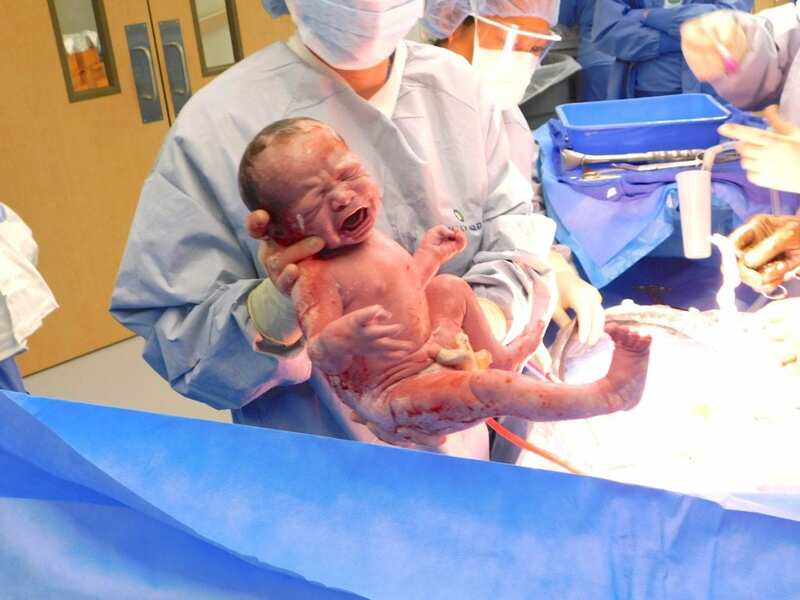 Even though it was surgery, it was probably my best birth experience, even better than my vaginal birth. I give a lot of credit to the wonderful nurses, my doctor, and especially my anesthesiologist for helping me to get the most out of my twins’ birth. Sarah Morel is a stay at home mom to four kiddos under six, including twin toddlers. 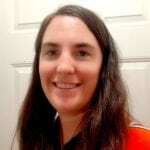 When not taking her oldest to and from kindergarten or cleaning the house, she enjoys reading (especially Harry Potter), chatting with other parents on online forums, and writing. You can find more about her on her blog.